Metering lights could be coming to Highway 101 in Marin as soon as 2015 and with them wider onramps. Though one wouldn’t expect this to be a boon to transit riders, this is an ideal chance for TAM to improve the county’s bus pads. It should not pass it up. Though most bus riders appreciate the speed of freeway-running buses, they do have a point. Crossing a freeway onramp without a crosswalk is dangerous and frightening. Transferring from a pad to a street stop can be a pain (and a trek). While the southbound bus pad might be right next to your destination, the northbound bus pad might be a half-mile slog away. And, of course, waiting at the edge of a freeway with nothing around but parking lots or low-maintenance landscaping can be exceedingly unpleasant. There are three areas where bus pads need to improve: access, comfort, and speed. Access means improving the connections between the surface streets and the bus pads, as well as moving the two pads closer together so both directions are accessible to development near the ramps. 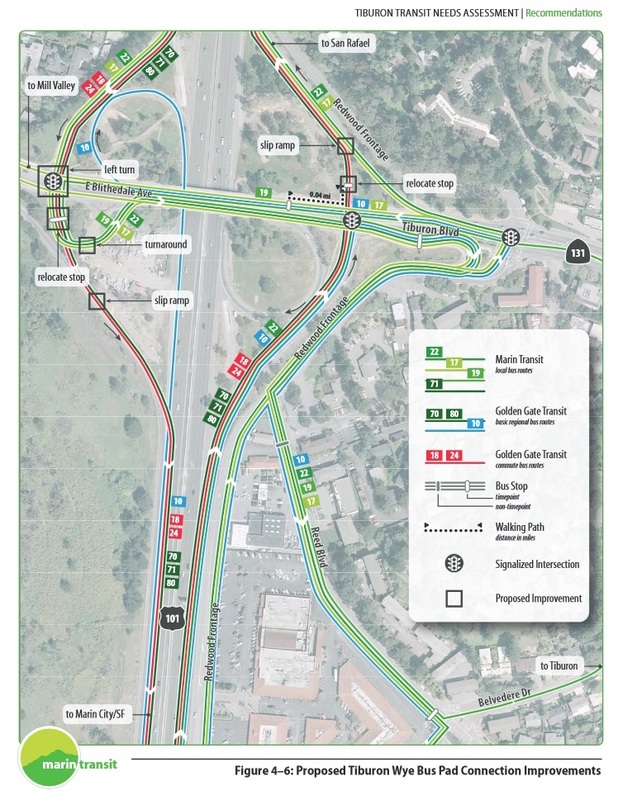 Caltrans redesigned the Tiburon Wye’s interchange – a “parclo” (partial cloverleaf) interchange common around Marin – to better facilitate bus pad access and transfers. The redesign, which is still on the drawing board, puts surface street and freeway bus stops as close together as possible and allows buses entering the freeway to use the pads. It is a good example of what is possible. The Tiburon Wye after its redesign. Click to enlarge, or click here for the full Marin Transit report (PDF). Image from Marin Transit. Where a redesign like Tiburon’s isn’t possible, the metering lights themselves present an opportunity to make bus pad access safer. If the metering light signal were linked to a pedestrian button, like a regular street crosswalk, a rider could simply press it and wait for a walk sign. That sounds much better than a running through a break in traffic. For comfort, the bus pads need shade and some greenery. Landscaping, especially shade trees, would go a long way. Approaching paths need similar treatment. Some bus pads, like the ones at Smith Ranch Road/Lucas Valley, have clear paths worn away by commuters approaching by more rational paths than the ones provided by freeway engineers. These should be formalized and upgraded with lighting, pavement, and shade. For speed, the proposed HOV onramp lanes would help at the places where trunk line and commuter buses enter the freeway, especially downtown Novato, downtown San Rafael, Larkspur Landing, Strawberry, Manzanita and Marin City. Shaving 30 seconds off each ramp for a bus with 40 people onboard will amount to a lot of time saved. Transit-friendly designs need to be baked in from the beginning of this process. That will allow staff to fully vet them before presentations to the governing boards and the state. The further plans get without these designs, the more difficult and expensive it will be to add them in. This is a once-in-a-lifetime opportunity to fundamentally alter how Marin’s transit moves along the 101 corridor. Let’s prove Ben Ross and the other East Coast naysayers wrong. We can do so much better than what we have, and now we have a chance to do so.